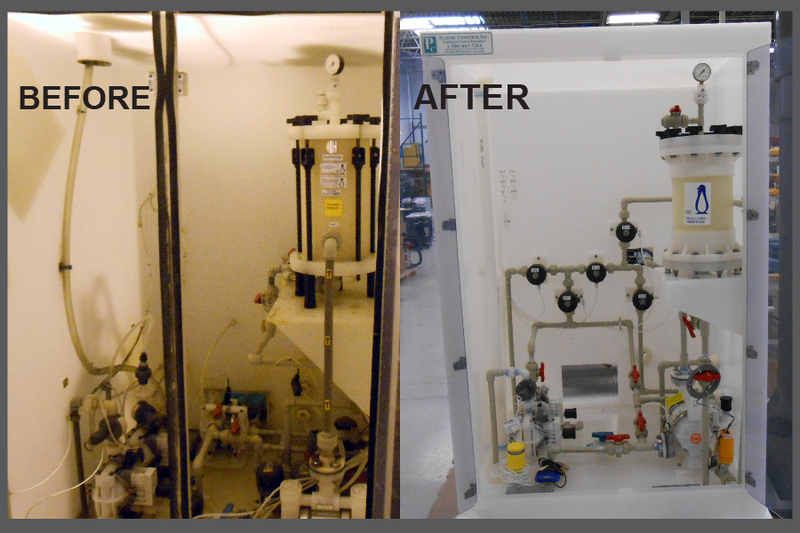 Our metal finishing customer, Coorstek/Saint Gobain/Norton was in need of an updated Chemical Delivery Cabinet. 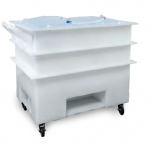 They used their Chemical Delivery Cabinet to pump a mixed acidic solution (Nitric Acid, Sulfuric Acid, and Hydrofluoric Acid) and deionized water from separate storage tanks into the holding tank of the delivery cabinet. Once in the holding tank, both were agitated into the process solution, pumped through a filter chamber and delivered to an off-line work tank for coupon processing. When the production run of coupons is completed, the mixed solution gets pumped back into the holding tank to be stored for future runs. 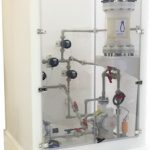 When the mixed process solution needs to be replaced (after about 5-6x), it is pumped out into waste storage drums and the cycle of fresh acidic solution and deionized water repeats. With all of this going on, you can imagine the maintenance required to keep it operating smoothly. The cabinet had been retrofitted and modified over the years to keep up with the changing needs and the time had come to replace it. 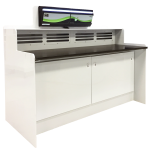 Plastic Concepts was asked to redesign a new cabinet to make it easier to operate, access and maintain. You can see from the photos that we have done just that, by changing the layout of the piping and components to make it easier for the operator to run, access and maintain components. If you read this post, let us know and we’ll send you a free gift! By selecting this button you agree to be added to our mailing list. A marketing and design freelancer lucky enough to work with this great company.